Anthony Joshua has beaten Breazeale to defend his IBF Heavyweight championship title a O2 Arena in London. It took just under 7 rounds for Joshua to complete the win and this is the first time in his career he has been taken beyond round 5. Dominic Breazeale took Anthony Joshua where he has never been before and thats past the 4th round for the first time in his 17 fight career. Overall it was a comfortable win for Anthony Joshua who had Breazeale’s number from the minute go but american put up a decent fight and took some big shots in the early rounds but incredibly kept on his feet till the round 6 when Joshua finally landed flurry of clean punches rocking Breazeale and than came the killer blow to finish the fight off. Joshua was dominant throughout the fight and many regarded this as his finest performance yet. As for Breazeale he has already reached full potential and never threw anything at Joshua to concern the opposing camp. Eddie Hearns made it clear that Joshua will be fighting less frequently from now and his next fight will be in November 2016 most probably against Joseph Parker which will serve as tune up to first major fight in summer 2017. Joshua has already signed up to commentate at the TEAM GB boxing for the Summer olympics in Brazil. Deontay Wilder, David Haye and Deontay Wilder are the names mentioned for Joshua but its unlikely he will face any of them anytime soon. It will all start with the undercard fight between Dillian Whyte taking on Ivica Bacurin in the 8 round heavyweight clash followed by Conor Benn taking on Lukas Radic in the super light-weight category. Chris Eubank JR will be in action against Tom Doran for the British middleweight title George Groves vs Martin Murray will co-feature the fight alongside Anthony Joshua vs Breazeale. 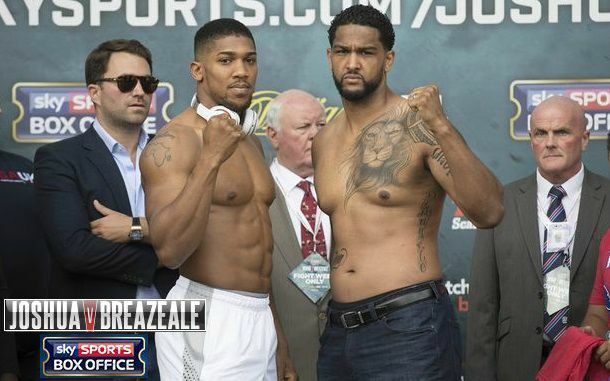 Joshua vs Breazeale Preview: The build up to the fight has been great as Anthony Johsua going into the fight in a hope to defend his title for the very first time. Not much expected of Dominic Breazeale who has a career record of 17 wins in 17 fights with 15 knockouts but he has yet to face a top level competition and against Joshua he is clearly the underdog. Joshua himself is unbeaten with a perfect record of 16 wins in 16 fights and knocking out each and every opponent so far. Joshua’s has only been taken beyond three rounds by British heavyweight Dillian Whyte and Joshua camp expect another knockout win in early rounds. In the undercard fights, George Groves is hoping to get the better of Martin Murray which will set him up as the mandatory challenger for WBA world super middleweight title. Chris Eubank Jnr is also in action against Tom Doran and there are talks of Eubank Jr to take on Gennedy Golovkin by the end of this year. Actually AJ has been past 4 rounds once before, against Dillian Whyte. Check your facts.